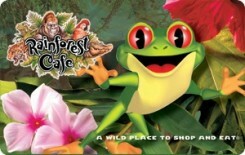 Earn 4.2 SB per $ when you buy Rainforest Café gift cards at MyGiftCardsPlus, powered by Swagbucks. Part adventure, part restaurant and wholly entertaining for the whole family, the Rainforest Cafe re-creates a tropical rainforest with waterfalls, lush vegetation and indigenous creatures. This Gift Card ("Card") may be applied toward the cost of food, beverage, and retail merchandise at any Landry's Restaurants. Inc. location. Each time you use this card we will deduct the amount used until the full Card value has been depleted. Your Card is not redeemable for cash, except where prohibited by law.